The subject of video game violence has been in the news a lot again lately. The media cycle seems compelled to bring it up every time we see another tragedy like Sandy Hook, where it was revealed the killer liked, among other things, to play video games. For many, video games once meant Galaga and Pac-Man. To them, the medium in its current state must seem completely alien. And, as ubiquitous as video games have become, the vast majority of gamers –or at least core gamers, as they’re known, the ones the media seems most concerned with- continue to be young males. Together, these elements also serve to make video games a much less penetrable medium than, say, film or music. There are very few video game journalists who are able to bridge that age and culture gap and examine the medium in a literate, insightful way. This is what makes Tom Bissell so interesting and compelling. His book, Extra Lives: Why Video Games Matter, attempts to be not only a work of serious game criticism and an attempt to give some thematic weight to not only many popular games, but also to give credit to their creative directors, often invisible to the general public, even though they carry the same amount of creative weight as authors and film directors, to properties that have grossed, in some cases, several hundred million dollars. Imagine a film making that much money and no one talking about the director. In between, Bissell also sheds light into the interesting history and development of the gaming industry, as well as a number of funny, insightful personal anecdotes from his own life-long gaming obsession. 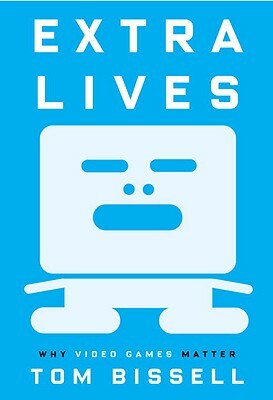 Extra Lives serves as both a perfect primer on the subject of video games for people who might not know much more than what they hear on the news and as a fascinating companion piece for avid gamers looking to expand their horizons on their favorite hobby. It is fitting that Bissell’s introductory notes talk about the difficulty in approaching game criticism with the same intent as literary criticism and how the mediums differ in such a way as to make the traditional form of criticism almost impossible, or, at the least, extremely time-consuming. “If I am reviewing a book,” he says, “I go back and look at my margin notes. An album, I set aside an hour and listen to it again. A film, I buy another ticket. If I am playing a game that takes dozens of hours to complete…much of it is accessible only by playing it through again, the game itself structurally obligated to fight me every inch of the way.” Bissell uses this conceit to frame the entire book, delving into questions about what elements actually define video games beyond their aesthetic and gameplay mechanics. In one chapter, he uses his trip to a prominent gaming company known for producing narrative-heavy games to discuss the nature of game narrative as a whole and the ways it differs from other mediums and in the different ways it both succeeds and fails as a unique form in of itself. Bissell is also rather candid about the perception of video games and those who play them. “More than any other form of entertainment, video games tend to divide rooms into Us and Them. We are, in effect, admitting that we like to spend our time shooting monsters, and they are, not unreasonably, failing to find the value in that.” Perhaps most refreshing is Bissell’s refusal to, at any point, condescend or talk down to those who are not interested in video games. It is not his intent to shame anybody into accepting video games, merely to provide a literate context for those who might be curious as to why others find them so interesting. This idea also provides the backdrop for many of the more colorful personal stories that see his gaming obsession abut against less-accepting portions of his life. And for those who are curious, yes, Bissell does examine game violence with the same considerate approach and insight, detailing the history of game violence and its detractors, including an amusing but eerily-familiar refrain on video games issues by Surgeon General C. Everett Koop in 1982, most curious since, as Bissell notes, video game violence in that time consisted of little more than “the collision and disappearance to two blocky abstractions.” The article eventually culminates in another interview with a game designer who’s very much aware of the thematic purpose and intent behind the violence he places in his games. While it is fair to say that many games are, indeed, violent, what Bissell wants us to grasp, is that this violence is not always as mindless or malicious and we’re often led to believe. It’s a particularly interesting chapter that acknowledges a lot of difficulties and problems that do exist in some games, but tries to offer the violence in these games with a context that is not dismissive or seeking to make any excuses. What all of this really does is allow Bissell to paint the gaming industry as a rather more interesting, creative and complex structure than many perceive it to be, and not the one that the mainstream media and politicians seem to believe is intent on creating “murder simulators” or trying to find insidious new ways to corrupt the minds of our children. It is an industry as varied as any other, governed by many differing opinions and populated by a colorful cast of creative, driven and insightful young minds, who are interested in pushing the bounds of their medium in new ways. If you’re not a gamer, Extra Lives probably isn’t going to convert you, but by the end you might start to understand why so many people love video games and why that isn’t such a bad thing. And if you are a gamer and believe that games should be considered art, Extra Lives isn’t just helpful to your cause, it’s required reading.